Royal ranks among the oldest and most experienced vacuum cleaner manufacturing companies. Their dedication to quality products has provided consumers with a vast array of vacuums to choose from, including the widely recognized Dirt Devil line. Royal manufactures vacuum bags in a variety of styles and types as part of their commitment to developing innovative cleaning solutions that their customers can value and trust. Standard paper filter bags are available for most of Royal’s long-lived line, including their popular Dirt Devil series. Bags displaying Royal’s “Royal-Aire” or “Micro-Fresh” label offer a higher level filtration, retaining up to 99.9% of all particles, including dust, pollen, bacteria and other contaminants, down to 5 microns in size. An electrostatically-charged liner traps all those allergy-inducing impurities while you vacuum. Allergy and asthma sufferers will appreciate the high filtration these bags provide, as well as anyone else concerned about the quality of air escaping their vacuum’s exhaust into their home. Bags available under the Royal-Aire label are typically yellow. 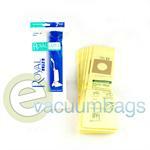 Royal also manufactures HEPA level filtration vacuum bags. HEPA filtration standards require that 99.97% of all contaminants down to 0.3 microns be filtered out, retained and prevented from re-entering the air. 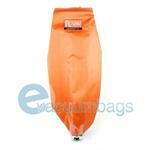 Those who suffer from severe allergies may prefer the extra high level of filtration that these HEPA bags provide. Capturing finer particles with higher filtration also results in less dust going through your vacuum’s motor, prolonging the life of your vacuum. Cloth outer bags are also available for Royal models that use them. Royal Type A Vacuum Cleaner Bags fit Royal metal upright vacuum cleaner models in these ranges 89000, 1010, 1018, 1020, 1025, 1028, 1030, 1038, 1040, 1050, 1058, 2000, 2008, 2025, 2028, 2075, 2078, 4000 and 4008. Available in standard and Micro-Fresh. Royal Type B Vacuum Cleaner Bags fit 673, 673Z, 1018, 1018Z, 1025, 1028, 1028Z, 1030, 1030Z, 1058, 1058Z, 7730, 7730Z, 089000, RY8500, RY8100, RY8200, RY8300, RY8400, RY6400, RY6500 and all other Top Fill Royal uprights. Available in standard, Royal-Aire, and HEPA. 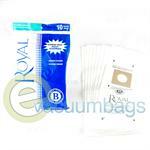 Royal Type BP Backpack Vacuum Bags fit Royal backpack models RY4000 and RY4001. Standard paper filtration bags. 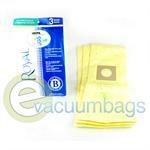 Royal Type H Vacuum Cleaner Bags fit Prince Hand Vacs and all Royal metal hand held vacuum cleaners. Standard paper filtration bags. 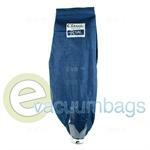 Royal Type J Vacuum Cleaner Bags fit all standard Royal Tank Cleaners. Available in standard and HEPA. Royal Type J Vacuum Cleaner Cloth Bag fits all standard Royal Tank Cleaners that take Type J bags. Royal Type N Royal upright vacuum cleaner model RY6900. Available in Royal-Aire bags. Royal Type P AiroPro Vacuum Cleaner Bags fit Royal AiroPro canister vacuum model RY1000 (3-RY1100-001). Standard paper filtration bags. Royal Type Q AiroPro Vacuum Cleaner Bags fit Royal AiroPro canister vacuum model RY2000. Standard paper filtration bags. Royal Type R AiroPro Vacuum Cleaner Bags fit Royal AiroPro canister vacuum models RY3000 (3-RY3100-001 and Dirt Devil Power Pak and Jaguar canister vacuum models 082475 and 082476. Standard paper filtration bags. 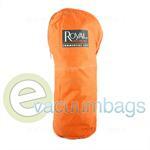 Royal Backpack Vacuum Cleaner Cloth Bag fits Royal backpack models RY4000 and RY4001. Royal Type S Backpack Vacuum Cleaner Bags fit Royal backpack models RY4000 and RY4100. Available in standard and HEPA. 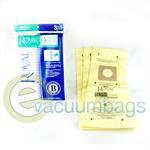 Royal Type T Vacuum Cleaner Bags fit Regina model HDU600 and Royal vacuum models RY5300 and RY5400. Royal-Aire bags. Royal Type U Vacuum Cleaner bags fit Royal Procision / Protege Royal-Aire Vacuum Cleaner models RY7400, RY7500, RY9700, RY9750 and UR30080, Dirt Devil Ultra MVP, Magnum MVP and Swivel Glide models, and Regina models HDU200 and HDU500 vacuum cleaners. Available as standard, Micro-Fresh and Royal-Aire bags. 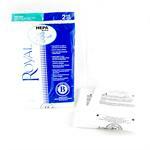 Royal Type V Vacuum Cleaner Bags fit Royal S15 Lexon Lightweight canister model SR30010. Standard paper filtration bag. 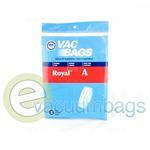 Royal Type Y Vacuum Cleaner Bags fit Royal CR50005 upright vacuum cleaners. Available in Royal-Aire and HEPA. Royal Type Y Reusable Vacuum Cleaner Cloth Bag fits Royal commercial vacuum model CR50005and WindTunnel upright. Reusable Cloth Bag. DVC Replacement Paper Vacuum Bags for Royal / Dirt Devil Upright Models Accepting Type C Bags. Generic Micro-Lined DVC Type D Paper Vacuum Bags for Royal / Dirt Devil Featherlite, Lite, Lite Plus, Extra and Classic Model Vacuums. 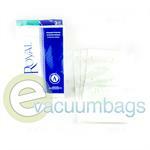 Genuine Royal-Aire Filtration Paper Vacuum Bags for Royal Upright Model Vacuums using Style A Bags. Gray Cloth Zipper Bag with Ring for Royal Model Vacuums using Style A Vacuum Bags. Hospital Paper Vacuum Bags made for Royal RY5500 Dual Motor Dealer Commercial Upright Vacuum Cleaners. 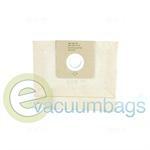 Royal Aire Filtration Paper Vacuum Bags for Royal Lite Model Vacuums using Type D Bags. Classic Edition Outer Cloth Zipper Vacuum Bag Assembly for Royal Metal Everlast Upright Model Vacuum Cleaners. 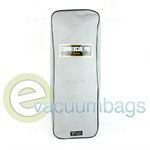 Commercial Outer Cloth Vacuum Bag with Zipper for Royal Metal Upright Model Vacuums. Cloth Bag accepts Style B Paper Vacuum Bags. EnviroCare Micro Filtration Type Q Paper Bags for Royal AiroPro RY2000 Canister Model Vacuums. 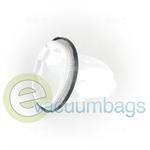 Cloth Vacuum Bag with Rubber Ring for Royal RY4001 BackPack Model Vacuums. Outer Cloth Zipper Vacuum Bag Assembly for Royal RY5000 Commercial Model Vacuums. 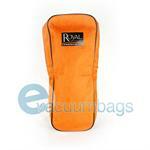 Orange Outer Cloth Bag for Royal RY5000 Model Upright Vacuums. Outer Cloth Vacuum Bag Assembly for Royal RY6500 Model Upright Vacuums and 11 Royal Type B Paper Vacuum Bags. 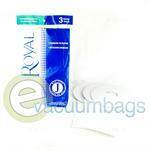 Royal Paper Vacuum Bag for Royal Early Metal Upright Model Vacuums using Style A Bags. 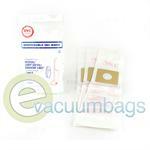 HEPA Paper Vacuum Bags for Royal Upright Models Accepting Style B Bags. 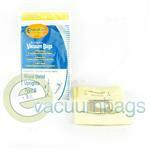 Generic DVC Paper Vacuum Bags for Royal Vacuum Cleaners using Style E Bags. 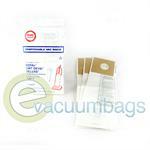 Genuine Style J Paper Vacuum Bags for Royal 400, 401, 404 and 405 Model Vacuums. 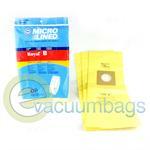 Generic DVC Paper Vacuum Bags for Royal Model Vacuum Cleaners using Style K Bags. 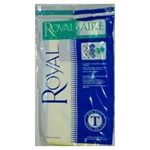 Genuine Style R Royal Aire Filtration Paper Vacuum Bags for Royal Canister Model Vacuum Cleaners. 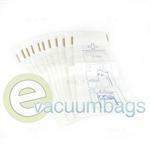 Micro Filtration Style R Paper Vacuum Bags for Royal Procision 3000 Model Vacuums. 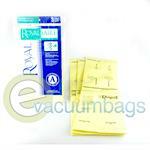 Genuine Royal Aire Filtration Paper Vacuum Bags for Royal Vacuum Models RY5300 and RY5400. Also, fits Royal Models using Style T Bags. 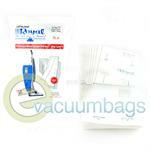 DVC Paper Vacuum Bags for Royal Upright Model Vacuums using Type A Bags. 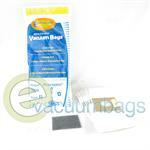 Genuine Top Fill Paper Vacuum Bags for Royal Metal Upright Model Vacuums using Type A Bags. Type AB Filter Vacuum Bags for Royal Canister Model Vacuums. Also, fit Dirt Devil Express Canister Model Vacuums. 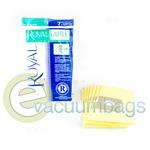 Genuine Royal Aire Filtration Paper Vacuum Bags for Royal Model Vacuums using Type B Bags. 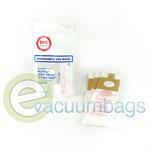 DVC Type B Micro-Lined Paper Vacuum Bags for Royal Upright Model Vacuums. (See Full Description for Models). 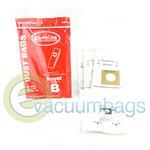 Genuine HEPA Media Paper Vacuum Bags for Royal Upright Model Vacuums using Type B Bags. 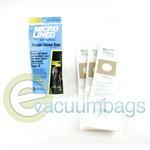 Generic Micro Filtration EnviroCare Paper Vacuum Bags for Royal Metal Upright Model Vacuums using Type B Bags. 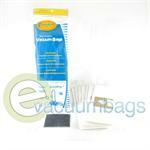 EnviroCare Filter Media Paper Vacuum Bags for Royal Upright Model Vacuum Cleaners Accepting Type B Bags.